Theory For you to make sense of ‘Systemic Agency’ you would have to be acquainted with some of the theory underlying the systems approach. If you are not, nothing is lost, because a quick initation is available from an overview of the theory on this website, which provides the necessary links to more information. It explains: (1) what is a wicked problem; (2) what is the systems approach; (3) the inner workings of our version of the systems approach, Wicked Solutions; (4) the reasons why the systems approach is not applied more often, although it should; and (5) the linkages with design and innovation. Learning all this can be quite an eye-opener, but the best way to acquaint yourself with the systems approach is by applying it to a wicked problem of your own, which is why we wrote Wicked Solutions. (2014, 2016). According to the main author, Bob Williams, the basic notion of Inter-Relationships, Perspectives and Boundaries, which forms the backbone of Wicked Solutions, had been kicking around the systems field for years, but entered its current form during a workshop at Stanford University by a bunch of systems folks in 2006 or thereabouts, so less than a one hour drive from Berkeley where Churchman did most of his work on the systems approach. Practice The systems approach of Churchman (1968) has never been formalized as a methodology, at least not by its originator. 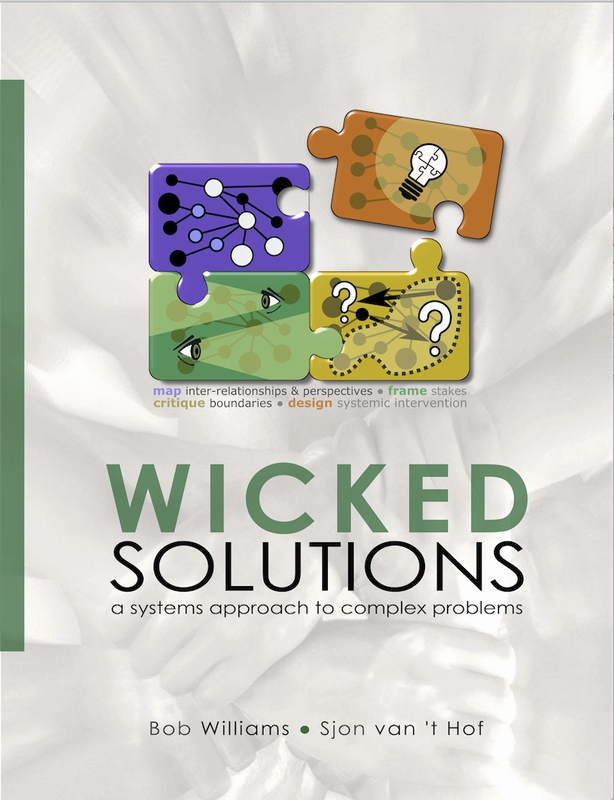 In late 2012, Bob Williams asked me to help him finalize a book on exactly such a formalization effort, which saw the light as a PDF in 2014 under the title of Wicked Solutions: a systems approach to complex problems. In 2016 we produced a second edition, now also in paper. The book is special in that it uses a fully worked case to guide the reader through the steps and stages of a systemic process that addresses the reader’s own wicked problem. The books main target audience is that of evaluators, university lecturers, and facilitators of all walks of life, including business and development. The list may be expanded to include entrepreneurs, managers, researchers, policy workers, spokespersons, secondary school teachers, and community workers. In a complex world, systems thinking is of the essence. Don’t hesitate to get in touch if you need some support.